In Nolan’s earlier Kelly paintings the landscape is often populated by dense pockets of scrubby bush and tall, sinewy trees, distinguishing them from many later works in which the bush gives way to more open expanses of land. Kelly in bush is emblematic of this earlier series as we see the bushranger in a forest of trees which dwarf and almost camouflage him as he appears on the far right of the picture plane. Standing in the shadows, Kelly’s rather sinister appearance is juxtaposed against the brightly coloured flowers in the foreground and by the slashes of intense yellow, blue and pink tones of colour where the sun filters through the trees. 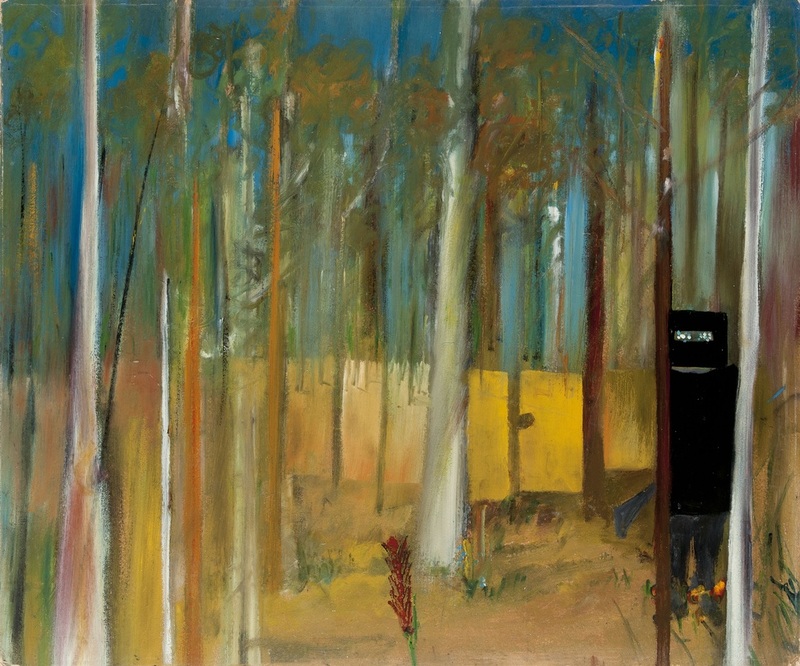 The bush remains central throughout Nolan’s career, and the sinewy, smooth and painterly appearance of these trees resemble those that feature in his multi-panel Riverbend paintings of the 1960s.